Each year millions of passengers fly over volcanically active regions such as Iceland and the North Pacific. Volcanic Ash Advisory Centers (VAAC) around world provide "warning system"
London, England (CNN) -- Volcanic ash clouds are a serious hazard to aviation, reducing visibility, damaging flight controls and ultimately causing jet engines to fail. 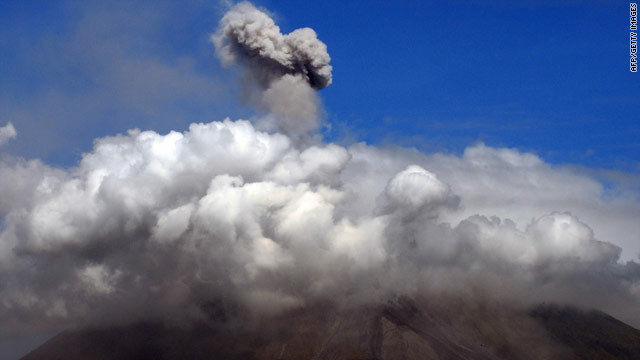 Encounters between aircraft and volcanic ash can happen because ash clouds are difficult to distinguish from ordinary clouds, both visually and on radar, according to the U.S. Geological Survey. Ash clouds can also drift great distances from their source. The recent volcanic eruption in Iceland sent a huge plume of ash moving across the Atlantic, disrupting air traffic across Western Europe. What happens when aircraft encounter ash clouds? According to Airbus, flying through an ash cloud should be avoided by all means. The aircraft manufacturer says experience has shown costly damage can occur to aircraft surfaces, windshields and power plants, while ventilation, hydraulic, electronic and air data systems can also be contaminated. Critically, it says the ingestion of volcanic ash by engines may cause serious deterioration of engine performance due to erosion of moving parts and partial or complete blocking of fuel nozzles. Volcanic ash contains particles, whose melting point is below that of an engine's internal temperature. During flight these particles will immediately melt if they go through an engine. Going through the turbine, the melted materials rapidly cool down, stick on the turbine vanes, and disturb the flow of high-pressure combustion gases. In the worst case this disorder of the flow may stall the engine, the manufacturer's operational guidance says. Can these ash clouds be detected? Each year millions of passengers fly over volcanically active regions such as Iceland and the North Pacific, which has more than 100 active volcanoes and four to five ash-producing eruptions each year, the USGS says. As weather radar is not effective in detecting volcanic ash clouds, pilots rely on accurate forecasts of volcanic eruptions along their air routes. There are nine Volcanic Ash Advisory Centers (VAAC) around the world designated by international organizations to provide expert advice to national meteorological agencies about the location and expected movement of volcanic ash clouds. Have there been any fatal incidents? No. But a number of aircraft have flown into ash clouds over the years, resulting in a few near-fatal incidents. In April 1982, British Airways Flight 009 en route to Auckland from London flew into a cloud of dust and ash thrown up by the eruption of Mount Galunggung, on the Indonesian island of Java, resulting in the failure of all four of its engines. Fortunately the pilots were able to glide the Boeing 747-200 far enough to exit the ash cloud, before three of the engines were restarted, allowing the crippled flight to divert to Jakarta and perform a safe landing. At the time it was the longest glide in a non-purpose-built aircraft. The event was also remembered for the announcement made by the airliner's remarkably calm captain, Eric Moody. He told passengers: "Ladies and gentlemen this is your captain speaking. We have a small problem. All four engines have stopped. We are doing our damnedest to get them under control. I trust you are not in too much distress?" In December 1989, KLM Flight 867 en route to Anchorage in Alaska from Amsterdam flew into a normal looking cloud, which turned out to be a volcanic ash cloud -- the result of an eruption of Mount Redoubt, a volcano in the Aleutian Range. The pilots increased the power in an attempt to climb out of the cloud, but all four engines on the Boeing 747-400 failed shortly after and the standby electrical system failed. Fortunately the crew eventually managed to restart the engines two at a time, enabling the airliner to land safely at Anchorage, despite extensive damage to the windshields, internal aircraft systems, avionics and electronics.